This picture is of the Mill Gardens at the bottom of Mill Road, Warwick. This is an old picture and was taken whilst doing a history project in 2000 for GCSE History. If my memory serves me well then Richard Charlton was there too, thankfully out of the camera's lens! This scene struck me as I walked into the garden as it consisted almost entirely of green; even the water seems a little green due to the reflection of the trees. 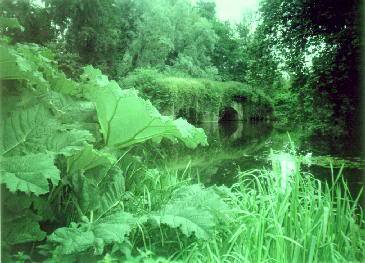 The ruined bridge is that of the old river crossing on the Avon by the Castle. The Garden is free to get into and they ask only for a voluntary contribution.